Description : KomalC is the inspiration born through our admiration for unique handmade accessories for men and women across the globe. Items that have their one of a kind appearance just like the one who owns them. products that could become a part of normal routine like they were never added. 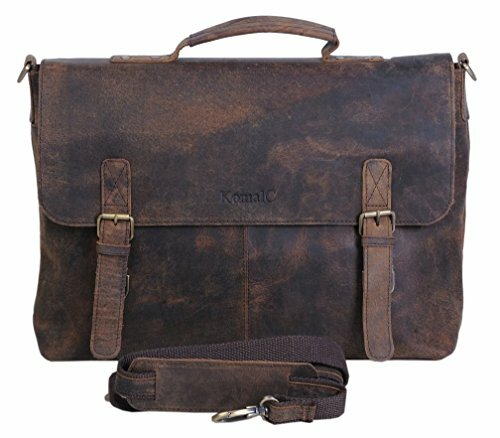 KomalC and Komal's passion leather present our buffalo Hunter leather messenger bag. A perfect accessory for the modern men and women , this vintage and simple design is the perfect companion for professionals' students and others. This bag is spacious enough to hold a laptop upto 15 inches along with some notebooks files and accessories like chargers etc. The padded compartment ensures added safety for the laptop. The Hidden snap closures underneath the buckles give you a convenient access while maintaining the rustic vintage look . The bag is lined with high end canvas lining which adds to the rich look . The external metal zipper gives you a convenient option of storing papers etc. Designed by komal Chaudhari , this bag is all you need to carry your daily routine stuff. At Komal's passion leather we stand by our products and hope that you enjoy our products as much as we enjoy making them. After your huge support to our brand Komal's passion leather , we are glad to introduce komalC , our new luxury yet affordable brand in high end buffalo leather. If you have any questions about this product by KomalC, contact us by completing and submitting the form below. If you are looking for a specif part number, please include it with your message.